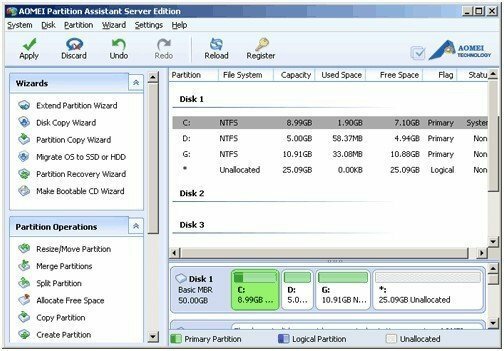 How to partition Server 2003 without Reinstalling Operation System.AOMEI Partition Assistant, has different versions (home/professional/server/unlimited/lite/technician edition), can serve different PC users. On March 28th, 2003, Windows Server 2003 was released. As is known to all, system volume space is not enough to store large size applications after years’ of using. In order to install and update important programs of Windows 2003, extend C drive to obtain more free space is of great importance. It is known to all Windows 2003 users that the built-in Disk Management of server 2003 is unable to carry out extending function. Thus, users cannot change its volume distribution. Turn to the third party software to partition hard drive in Windows 2003 seems the best way. AOMEI Partition Assistant, has different versions (home/professional/server/unlimited/lite/technician edition), can serve different PC users. For Windows 2003 users, Partition Assistant Server Edition is a good choice. This magic disk management software not only supports Windows 2003, but also compatible with Windows 2000 and 2008. Other versions of Partition Assistant can also work with Windows XP/Vista/7/8. Do you want to repartition your disk to obtain a reasonable volume distribution? Just turn to AOMEI software. Please free download it.